This piece was originally posted on the Media Co-op. For more #IdleNoMore coverage, click here. On the whole, the money that First Nations receive is a small fraction of the value of the resources, and the government revenue that comes out of their territories. Let's look a few examples. Attawapiskat has been in the news because their ongoing housing crisis came to the attention of the media in 2011 (MP Charlie Angus referred to the poverty-stricken community as "Haiti at 40 below"). More recently, Chief Theresa Spence has made headlines for her ongoing hunger strike. The community is near James Bay, in Ontario's far north. 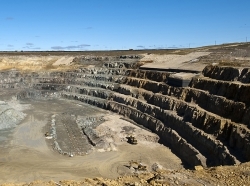 Right now, DeBeers is constructing a $1 billion mine on the traditional territory of the Āhtawāpiskatowi ininiwak. Anticipated revenues will top $6.7 billion. Currently, the Conservative government is subjecting the budget of the Cree to extensive scrutiny. But the total amount transferred to the First Nation since 2006—$90 million—is a little more than one percent of the anticipated mine revenues. As a percentage, that's a little over half of Harper's cut to GST. Sour gas flaring next to the community resulted in an epidemic of health problems, and stillborn babies. Moose and other animals fled the area, rendering the community's previously self-sufficient lifestyle untenable overnight. In 2011, an oil pipeline burst, spilling 4.5 million litres of oil onto Lubicon territory. 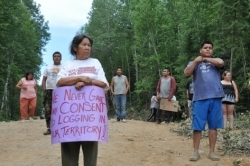 The Lubicon remain without a treaty, and the extraction continues. From the days of beaver trapping to today's aspirations of becoming an energy superpower, Canada's economy has always been based on natural resources. With 90% of its settler population amassed along the southern border, exploitation of the land's wealth almost always happens at the expense of the Indigenous population. Canada's economy could not have been build without massive subsidies: of land, resource wealth, and the incalculable cost of generations of suffering. These industries are mostly take place on an Indigenous nation's traditional territory, laying waste to the land in the process, submerging, denuding, polluting and removing. The human costs are far greater; brutal tactics aimed at erasing native peoples' identity and connection with the land have created human tragedies several generations deep and a legacy of fierce and principled resistance that continues today. Movements like Idle No More give a population asleep at the wheel the chance to wake up and hear what native communities have been saying for hundreds of years: it's time to withdraw our consent from this dead end regime, and chart a new course. Dru Oja Jay is a writer, organizer, Media Co-op co-founder. Co-author of Paved with Good Intentions and Offsetting Resistance.